There are 2 ways you can use GDPR encryption: manual and automatic. Both of them allow you to remove the data of your prospects to comply with GDPR. To learn more about our new feature head over here. Select the prospects you want to be removed (encrypted). Click on the 'Actions' tab which will appear on the right-hand side. 6. You successfully encrypted the data! 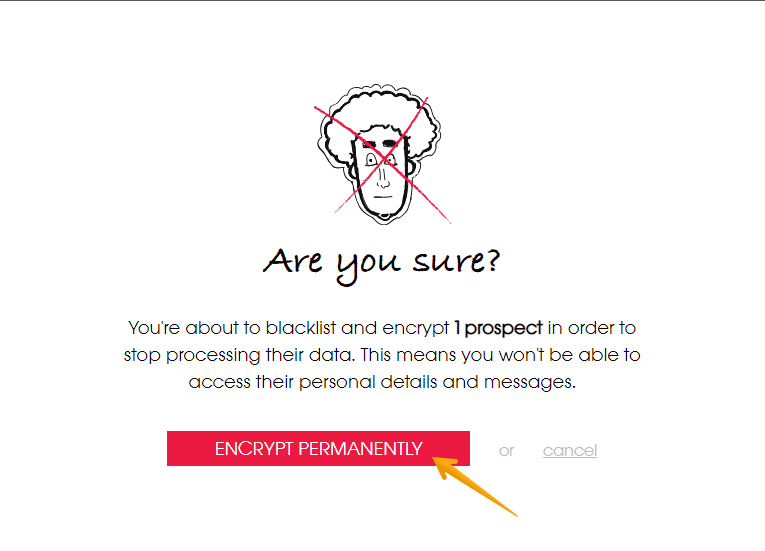 You'll see that status of the GDPR-encrypted prospects will change into 'Blacklist' - that's the sign their data was erased from our database. This way, Woodpecker helps you avoid contacting these prospects ever again. 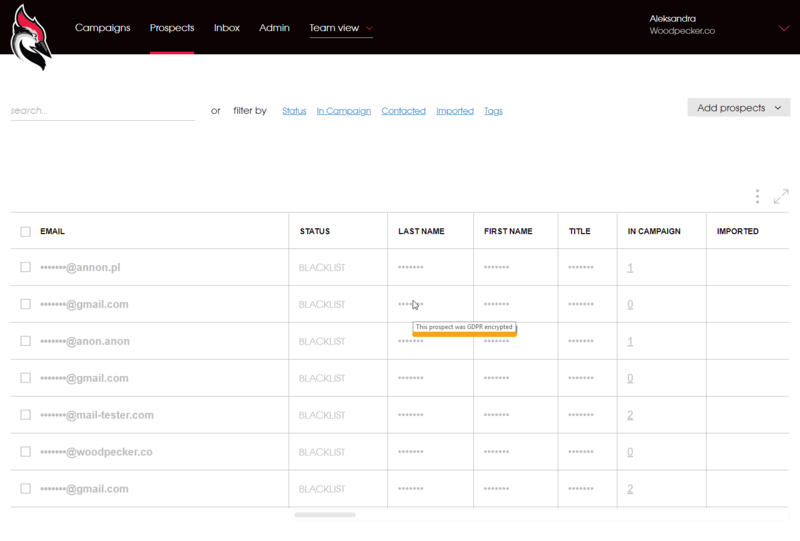 Create or go to a previously added campaign and click 'Edit'. Scroll down to the content of your message. Click 'more' to expand the selection of snippets. Select the UNSUBSCRIBE. The unsubscribe link will appear at the place of your cursor. Tick the box 'GDPR compliant unsubscribe' (you'll find it below Delivery Time). This link will redirect your prospects to a page where they can choose to either simply opt out (unsubscribe) or to unsubscribe along with having their data deleted from our database. Q: What happens once the data gets encrypted? A: Neither you nor Woodpecker will be able to process that personal data after that. You won’t be able to see the data. The data won’t be stored in the Woodpecker database anymore. In your Woodpecker panel, you’ll only see a string of bullet points instead of the personal data you entered. Q: How can I know that the prospect in a campaign got encrypted? A: Go to the ' Edit' mode of your campaign. 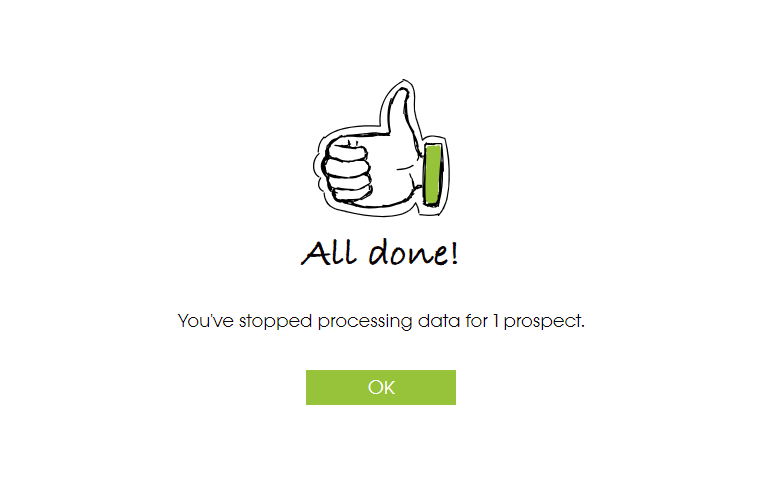 In the 'Prospects' section, you'll find the information about the number of your prospects. The contacts whose data was encrypted won't be shown. How to style and adjust your 'unsubscribe' link? Here you'll find more information on how to do that. To make sure the unsubscribe feature will work as intended always use the snippet 'Unsubscribe' to add the 'unsubscribe' link (in every email in the sequence). Simply copying the link from the content of other emails in your campaign (even if it is a previous email in the sequence) will not work, and the prospect will not be able to unsubscribe properly.